Shirts for the whole family. Available in several colors. The design is embroidered over the heart or in the center depending on the style you choose. It is done in bright colors or in ALL one color of thread. The smaller over the heart design is approximately 4in wide and 4in tall and the larger design for the front center of the shirt is approximately 7in wide and 5in tall. This design is embroidered not screen printed. You choose the size, style and color of shirt, you choose the color of the thread and you choose the size of the design. Please be aware the Hooded Zip up jacket and Polo shirts will only work with a 4x4 design. The choices for this shirt are endless. These shirts are co-ed sized so they are meant to fit men and women so choose sizes accordingly. 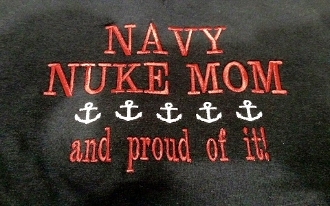 Some examples of shirts you could get are Navy Nuke Mom, Navy Seabee Mom, Navy Rescue Mom, Navy Aircrew Mom, Navy Band Mom, Navy Band Geek, Navy AO Mom, Navy IT Mom (or any rate), the possiblities are endless. And it doesn't have to be mom, It can be anyone, Dad, sister, brother, Bro, Nana etc. Make sure when you choose your thread colors that you pick something that will show up the shirt color you picked. If you want the words and anchors to all be the same color then choose the same color in the option for the words and anchors. If you need more space you can add special instructions before submitting the order.